Cycle time is money. BOOM! 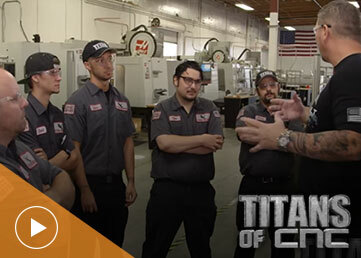 Titan America is constantly beating global competition because of advanced programming and machining techniques that significantly reduce cycle time. With the latest technology in Autodesk HSM solutions, Titan teaches his team how to generate fast toolpaths and optimize the power of the machine to stay competitive with manufacturing. Titan chooses Autodesk HSM solutions for his CNC programming for its robust toolpath generation. Learn how adaptive clearing, fixturing multiple parts and quickly adapting to design change reduces cycle time. Traditional roughing operations force people to run slower. Using Adaptive Clearing will allow your machine to run at the maximum feed-rate for the load at all times and extend the life of the tool. When the machine is not cutting, you’re not making money. Time saved during fixturing is time that can be spent milling. See some ways fixturing one or multiple parts can save time. Changes to your model don’t have to derail your programming time. Cutterpath associativity with the model means your CAM programming can change with the part. Stay tuned to TITANSofCNC.com for the launch of the biggest CNC educational platform, coming this fall.